Them folks over at Savvy Company know how to throw a party. Debbie Trenholm, founder and sommelier extraordinare at Savvy, invited me to "52 Wines - One Unforgettable Place", a tasting from the wineries of Niagara-on-the-Lake. Like I could say no! I haven't been to Niagara in ... oh, lemme check ... forever, and although I did manage to try a few things at the Wines of Ontario shindig in May, I was eager to see what was new, and catch up with a few friendly faces I hadn't seen since the last WFS. But first, I had to fortify my stomach. That meant only one thing: meat. I am a carnivore, and proud of it. 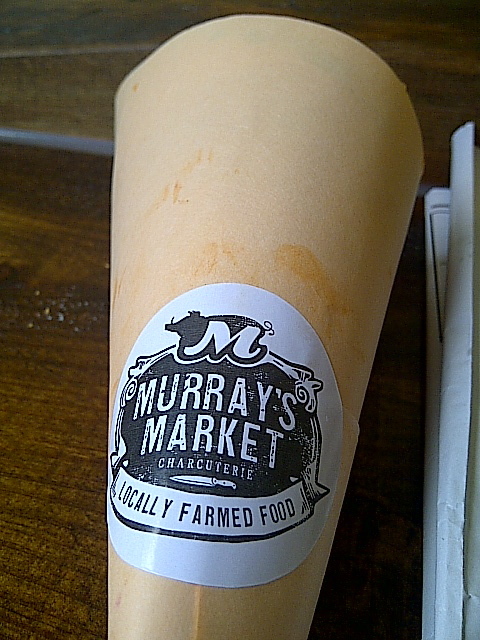 I've been looking for a chance to hit the Murray Street Bistro since it opened, but you know how it is. Then Murray's Market opened up over on Dalhousie (with good friend Kyle McNeil doing double-duty as butcher and front-of-house smiley-face.) Now was my chance! 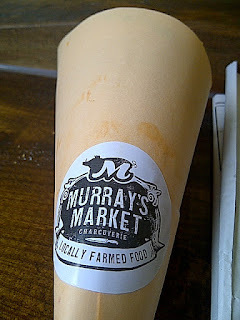 Murray's had that old-school deli / small-town rural feel to it, just slightly off the main drag of the Byward Market's preppy restaurant and dance club scene. The hardwood floors, the antique signage here and there, crates and straw serving as decor. The display was chock full of terrines, salamis, cheeses, while the back kitchen was dedicated to bringing the meat-eaters to-die-for munchies made to order. I was drooling over the Fifth Town cheeses and perusing the menu when I saw "the Charcutercone". Meat in a cone. Set me up. And they did: elk kielbasa, a variety of salamis, handmade hot dog and a few more meaty bits topped with cheddar, pickles and their own special mayo. Oh my gravy, that was good. I heard my arteries screaming for mercy before I was even halfway done, but it was well worth it. Hunger sated, I walked off my meal on the way to the NAC. The place was already buzzing with a crowd of 150-strong by that point (it sold out, selling more tickets than the event held in Toronto. Yay Ottawa! We likes us our wine ...) Debbie and her crew did a fab job, from start to finish. The Panorama Room provided ample space to stroll around the booths; a few benches and four-tops dotted here and there to put one's feet up while sipping on a sample was a nice touch. With a limit of two wines per table, it wasn't a marathon, nor was it expected to be. This felt more like a party, especially with a jazz quartet murmuring a mellow undertone beneath the buzz of conversation. I was glad to see several wineries represented here that don't normally make it out to the WFS or to other shows. My only disappointment was that neither the Niagara College Teaching Winery nor Stonechurch were there, despite their listing on the brochure. Darn, I guess I'll just have to make a run down some time this summer. The chosen theme - strictly Niagara-on-the-Lake wines - meant for a narrowed focus and an opportunity to more closely compare varietals, styles and techniques between one winemaker and the next. And it meant the closely knit group of winemakers from that little corner of the province could truly let their talents shine. 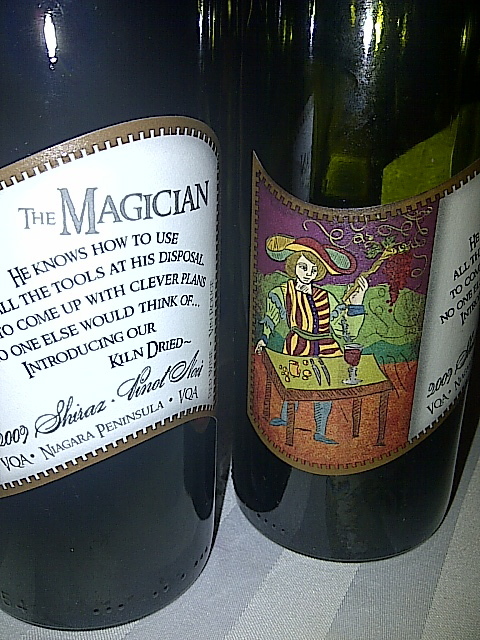 Reif 2009 'The Magician' Kiln-Dried Shiraz Pinot Noir - Now here's an intriguing blend if I ever tasted one. 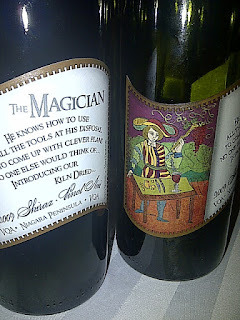 Heavyweight shiraz paired up with the delicate p.noir as dance partners, and given the appassimento treatment, to boot. The results were thick, raisined and juicy red-fruit characteristics and a nose full of jam, pepper, cloves and cocoa. 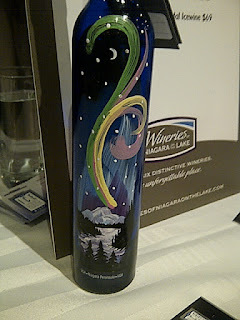 I knew about this one from the previous Ontario event; can't wait for it to come out in the LCBO. Colaneri 2009 Fumoso Bianco - Italian-style fumé blanc. Lemon zest and white cranberry aromas, with a subtle honeydew melon lingering on the palate with its mineral and smoky presence. Firm acid with a fizzy finish, this wine has more character and oomph than your typical sauvignon blanc, and more fruit than some fumés I've had in the past. Lailey 2010 Sauvignon Blanc - Lemon meringue pie in a glass! Soft, plump texture, muted acids and round fruit. I could almost detect a bit of nutmeg ...? Viscous, mouth-coating texture with a warm finish. Definitely something best paired with food, maybe a creamy pasta dish. Pillliteri 2010 TWENTY-THREE Rosé - This is part of their 'fun and frisky' label, and is a good one for those who don't like rosé. The sweet nose of strawberries and maraschino cherries belies the dry, chalky palate that yields only a fraction of the fruit from the nose. Good patio wine. Pondview 2010 Dragonfly Pinot Grigio - My 'best wine' of the night. Done unoaked, in the 'Italian style', this had apricot, melon and flint up front, followed by a zesty, effervescent mouthful that was superbly balanced between sweet and dry. I'd love to try this with oysters as an alternative to s.blanc. I finished things off with a generous tipple of award-winning Ice House 2006 Northern Ice Vidal Icewine: everything you'd expect from this classic dessert staple, all done up in individually hand-painted bottles (done by NOTL artist Ron Paré). I would have bought the wine just for the bottle, but they were kind enough to share an empty with me. I can't tell you how many weird looks that got me on the bus ride home, though. Nice post Bethany. Nice to see you too!